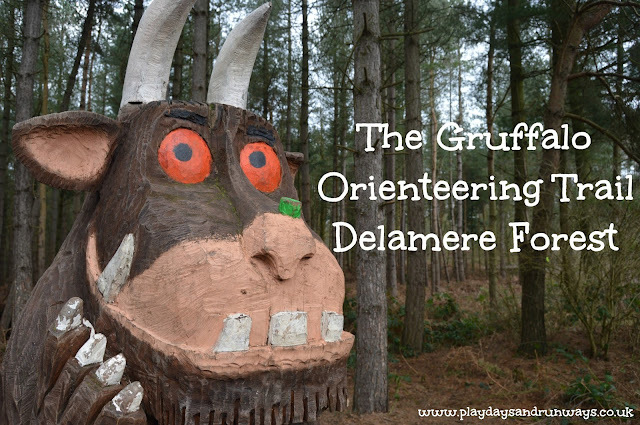 A few weeks ago I was reading another blog and noticed that The Gruffalo Trail was at Delamere Forest. I was so excited because I knew little J would love hunting through the woods in search for the Gruffalo. It's been one of his favourite books for a few years now and last year he even had a Gruffalo birthday party. So last weekend we headed to Delamere Forest in search for the Gruffalo. If you have been to Delamere before you will know that there are quite a few car parks, however we decided to head straight to the Forest Centre car park as we wanted to buy a map of the Gruffalo trail. The Forest Centre car park is situated by cafe, toilets, bicycle hire and the starting point to all trails. It is a sharable car park with an all day charge of £6. You can pay less if you are only staying for a hour or two. Once we were parked we headed to the shop to purchase our map which was £1.50. The starting point is just outside by the picnic benches. There are 12 points to follow on the trail so once we had a quick toilet stop we were ready to go. I would recommend going to the toilet beforehand as once on the trail there are no toilets available. It is approx one and a half miles however it does seem longer especially if you venture off track and go exploring in the woods and den building. The trail is accessible for all ages and abilities however it was very muddy and I did see people struggling with prams at some points throughout the trail. We wandered in to the woods a few times firstly to do den building although there was a den already built so after playing in it for a little while we knocked it down. We found big logs and sticks and had lightsaber fights with them. There is a point at the beginning of the trail were you walk over a bridge. The bridge is over the railway tracks although we didn't get to see a train unfortunately. As you go along the trail there are 12 sign posts to look out for - this lets you know you are going the right way. They have questions on and if you have bought the map you can answer them in the activity booklet. We got almost half way before we stopped to have a snack. It was the first time we had seen a bench so took the opportunity to have a quick drink and a cake that I had brought with us. We went in to the woods a few more times looking for leaves and pine cones. Little J loves exploring and getting muddy. Shortly after we had got back on to the path we saw a crowd gathered ahead so we assumed the Gruffalo was close by, we were right. When we got to the Gruffalo little J was so excited. He was huge and looked like the real thing. After we had posed for a photo we noticed just behind the Gruffalo there was another den. Was a this were the Gruffalo sleeps at night? We went down to have a look and little J climbed inside. The Gruffalo isn't actually at the end of the trail there are still 3 more sign posts to look for until you come to the official end of the trail. It took us about one and half hours to complete the trail although like I said earlier we did go off the trail quite a bit so I suppose the time it takes depends on whether you stick to the trail or not. When we headed back to to the Forest Centre we were going to stop for a hot drink in the cafe however the queue was huge. In fact every time we have visited Delamere the queue in the cafe has been large. We brought our own lunch so decided to give it a miss. We will definitely be back to Delamere Forest again for more Gruffalo adventures after April 1st 2017 when the Gruffalo Spotters Trail begins. You can also now take part in the Highway Rat activity trail, check out Captain Bobcat's Highway Rat Adventure. Have Kids Will travel also did the Fforest Fawr Sculpture trail which looks fun, check it out. What a lovely thing to do with children and all Gruffalo fans and a lovely way of teaching them their first orienteering skills. This looks like a fab event! We had one locally do us which was great although the kids were terrified of The Gruffalo! My sister took my niece here and I nearly went with them but couldn't, apparently it was awesome and so great for the whole family. That looks like so much fun! I love the Gruffalo animations. You beat us to it....it's on my list of things to try and fit into March. My nearest trail is at Sherwood forest. Luckily the café isn't as busy as yours lol. Sounds like you had lots of fun and you have reminded me not to forget to go. This looks like so much fun. My kids would love to visit this place.